Sean Rudnick treats and studies liver diseases such as primary sclerosing cholangitis and primary biliary cholangitis to help prevent the need for transplants. 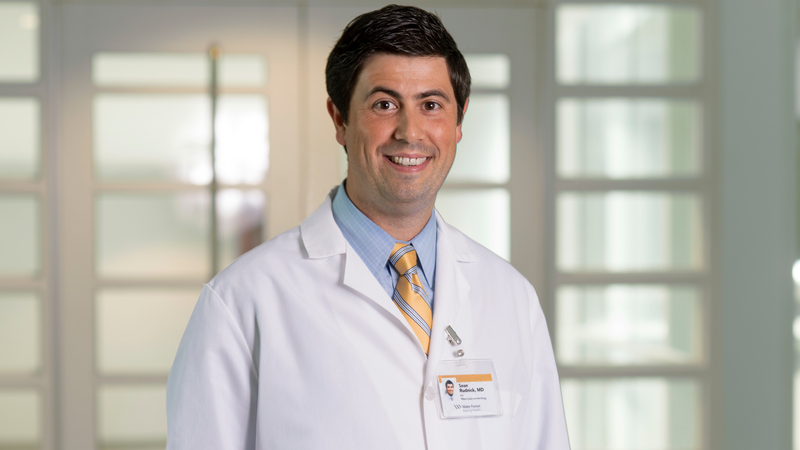 A clinically trained hepatologist who is board certified in transplant hepatology, Sean Rudnick, MD, is an expert in the diagnosis, management and treatment of liver diseases including liver transplant. In partnership with industry, he also conducts clinical trials of novel treatments for liver diseases. After completing medical school at the University of Buffalo School of Medicine and Biomedical Sciences in 2009, Rudnick spent six years training at the University of Virginia in an internal medicine residency and gastroenterology/hepatology fellowship. He also completed a one-year fellowship in transplant hepatology at the University of California, San Francisco. In 2016, Rudnick joined Wake Forest School of Medicine’s section of gastroenterology to treat and study liver diseases. Rudnick is primary investigator on a study of primary sclerosing cholangitis (PSC), a chronic autoimmune liver disease characterized by progressive inflammation and fibrosis with damage to the bile ducts that tends to affect young people. There are no current treatments. His interest in PSC is both clinical and research focused. He treats several patients with this uncommon, incurable condition and sees an unfulfilled need in clinical practice. Through his research, Rudnick hopes to explore the role of a treatment option using a combination of two existing medications that have been used in liver diseases of similar pathophysiology. He is also particularly interested in several aspects of liver cancer, such as how to best treat patients who are not candidates for transplant. As his research career evolves, Rudnick envisions exploring collaborative opportunities in areas such as tissue bioengineering, the effects of weight loss on liver diseases, and the use of endoscopic ultrasound in diagnosis and management of liver diseases. Rudnick would like to collaborate with industry, focusing on clinically useful projects to leverage the current high degree of market interest in prevention of progression of liver disease to cirrhosis and its attendant complications. He also sees an opportunity for industry to become involved in seeking new applications for technology to revamp the clinical approach to treatment of portal hypertension. He believes that Wake Forest is uniquely positioned to work with industry partners in drug trials, because its location in the state and region provides a convenient patient population for clinical studies.